Located on Anstasia Island, two miles south of St. Augustine Beach, the Frank B. Butler County Park offers a quiet beach with full facilities for visitors. The park is dedicated to preserving the sensitive dune system that is home to the endangered Anastasia Island Beach Mouse and the gopher tortoise. Butler Beach, Florida, played a significant role in the struggle for civil rights in the 1960s. The beach is named for Frank B. Butler, a local African-American businessman and leader in St. Augustine's civil rights movement. Though St. Augustine beaches were de-segregated by law at the time, the reality was different, with Butler Beach, where blacks were permitted, sandwiched between the "whites only" beaches of St. Augustine Beach and Crescent Beach. The "wade-in" that was held at St. Augustine Beach in June 1964 led to a violent confrontation and several arrests, which attracted national media attention and influenced Martin Luther King Jr. to come to St. Augustine, all of which led to the signing of the Civil Rights Act later in the year. The park's expansive shoreline and beautiful location on scenic A1A south of the Mary Street Ramp make it a popular beach destination for visitors and locals alike. To inquire about reserving the picnic pavilion, please call (904) 814-9030. Lifeguards are staffed on the beach seasonally. The park is open from sunrise to sunset daily. Call (904) 209-0752 for more information. 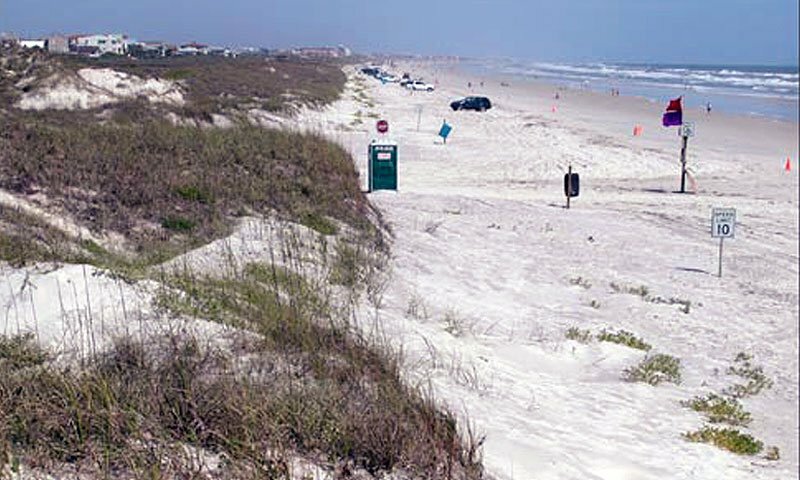 Vehicle beach access is offered at the two access points in Butler Beach: at Matanzas Avenue and at Mary Street. A nominal access fee is charged from March 1 through Labor Day to drive on the beach. Visit here for more information. Rules for driving on the beach are clearly posted and are strictly enforced for the safety of beach goers. Horseback riding is allowed during designated times only with a special permit at the Minnie Street walkover. More information is available here. Well-behaved dogs on leashes are allowed at most St. Johns County beaches, including Butler Beach. Beach access points for Butler Beach are included in this interactive map. Be the first to Review Frank B. Butler County Park!